True confession: I have never read Alice in Wonderland. I have, however, seen the Disney cartoon and the Tim Burton movie; how accurately they films follow the text is something I don’t know. But I can say that I have never really been a fan. Who I am a fan of, though, is Colleen Oakes. I’ll read anything and everything she writes – and I’ll probably love it, too. I certainly did love Queen of Hearts. This book is the first in the Queen of Hearts saga, a planned trilogy set in the fantasy realm of Wonderland. 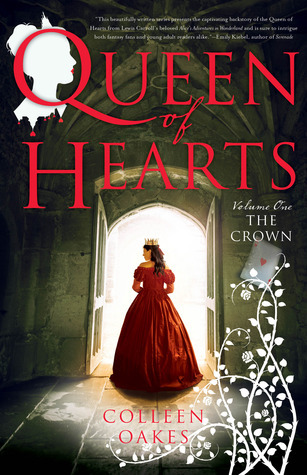 the story is Dinah’s – the first-born child of the King and Queen of Hearts – of “off with their heads!” fame. A 15-year-old girl when the story begins, Dinah is learning to someday rule the land. (But she would much rather be spending her days with her best friend – and the boy she loves – Wardley, and indulging with tarts. Be honest: wouldn’t we all?) But the closer her coronation comes, them more the royal castle shimmers with suspicion. Dinah’s father is cruel; a black-hearted ruler more feared than he is loved by his subjects. And it seems his hatred toward his daughter grows daily. In short, this is a fantastic story. Filled with familiar characters – the white “rabbit” always hopping about excited about the time, the Cheshire “cat,” the mad hatter, and even the decks of cards. It’s crafty, clever, and oh so captivating. A glimpse behind the crown, showing us how the fairy tale queen – always seen as cruel, evil, and bloodthirsty, ordering the beheading of so many – truly came to power and nearly lost her own head. Queen of Hearts has a bit of everything – romance, fantasy, action, adventure, and intrigue. Not to mention a cliff-hanger ending that left me (blood)thirsty for more! Will definitely have to look into this one. I love when the old stories are switched-up this way, and new leads are followed. I credit Gregory Maguire as starting the trend with his Wicked series, but I may be wrong, and there are so many others who’ve successfully played around with these bastions of our fairy tale youth. Reading this review made me think of going with my daughter a few years ago to see “Mirror, Mirror” with Julia Roberts, and being pleasantly surprised at every turn in the way the writers put a new spin on the longtime favorite. Good post. Thanks!